You might be missing out on large format printing opportunities that could take your business, marketing, and promotions to new heights–and sizes! Most people think of paper when they talk about printing, but large format printers open the doors to new ideas and substrates to solve creative problems for your retail displays, branded materials, or installations. You can create stunning logos on the side of vans, print textured brick on walls or floors, and more! 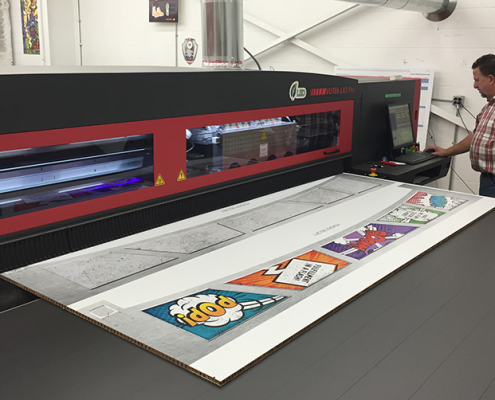 There are lots of applications and possibilities when it comes to large format printing. Here are four examples that are just the tip of the iceberg. Why settle for a normal paint job on your company van or car when you can show off your brand in style? The ability to print any image or color for vehicles with large format printing technology opens up a new road for your marketing and branding. Don’t settle on a simple door magnet for your logo when you can bring something special to your vehicle with printed graphics. Creating stunning art to showcase your product, decorate your office, or promote your products has never been easier. You can create custom graphics with bold and stunning designs for product displays, welcome signage for customers and clients, or details and promotions for installations. All you need to do is use a large format printer to bring it to life. Why settle for a simple framed picture or poster when your entire wall can be the frame? Do you want a trade show booth created completely out of honeycomb core substrate? The old way of printing would’ve needed to print and then mount the designs on the boards, but now printing technology lets us print directly on substrates. That means that you can get stunning trade show booth designs, beautiful signage, or other printed materials without the added step. This gives you a clean design, a bold look, and more options for your projects. Do you need to make your hallway look like a path of stones? Want to put your logo or message on the pavement outside for an event? With large format printing, that’s completely possible! 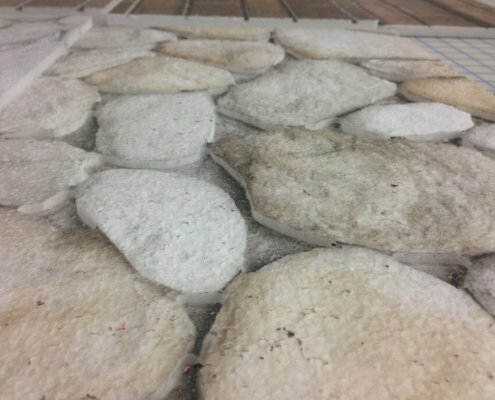 For example, check out the textured stone pattern below. This was printed directly on a substrate and looks fantastic. Imagine using this same technique on a floor or wall for your next installation or retail display. Whether you’re looking to show off your brand or create stunning pieces for events, retail, or manufacturing, large format is your new go-to for getting your message into the world. Want to get started on your next large format project? Contact us to set up a meeting and we can help you bring your dream to life. Dream big, print larger–with Gilson! What the elf? Where’s my Gilson holiday campaign? Interested in how Gilson can Create, Produce, and Deliver big projects? Sign up for the Gilson Graphics newsletter for insider info, blog posts, and more!